As Southwesterners pray: "Praise the LORD and pass the pigskin!" Tim Tebow (/ˈtiːboʊ/; born August 14, 1987) is an American football player who would be termed a professional, except that "professional" implies working for pay, and Tebow is not getting any. However, he holds the NFL record for Snaps with Divine Blessing, On-field Miracles, and Deuses ex Machina. He is also devoutly Christian, which means that he is a marketing pariah throughout the league. Tebow is the youngest of five children of openly Christian missionaries. He was born during a mission to the Philippines in which his pregnant mother contracted dysentery. Technically, this was Tebow's first football miracle, as the doctors punted and recommended an abortion. Tebow's devout parents opted to "go for it" on this obstetric fourth down, and Tebow was born not only alive but with a dim halo around his head. Back in the United States, Tebow's parents, both still openly Christian, not only instilled their strong religious beliefs in the child, but home-schooled him. These two traits would eventually endear him to Tea Party football fanatics (those that President Obama once ridiculed as "clinging to their guns and footballs"), but be anathema to the East-coast swells the league would try to attract to the sport. Tebow came into prominence in 2003 at Nease High School near Jacksonville, Florida, playing as a quarterback. Though still home-schooled, he rode the bus to Nease for notebooks and pencils, technically qualifying for the varsity team. Later that year, he suffered what would later be diagnosed as a broken fibula. Not only did he finish the game, the game video, though taken on the primitive movie cameras of the day, shows him walking an inch or two above the surface of the field. 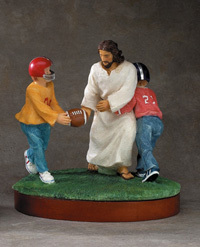 Theologians agree that this was Tebow's first miracle on an actual gridiron. For those without comedic tastes, the so-called experts at Wikipedia have an article about Tim Tebow. Answering even more prayers, Tebow played for the Florida Gators in 2006 through 2009. In a game against Kentucky, Tebow suffered a concussion and was out for several minutes. (Consult Wikipedia if you want to know if he barfed.) However, miraculously, the Gators had a bye the next week, and Tebow was ready to play in the Gators' next game, a week after that: his first football miracle at the collegiate level. He declined to enter the 2009 NFL draft in favor of finishing college, again flaunting that unfortunate wholesomeness. Famously, Google's entire server farm crashed, as a star-struck nation simultaneously tried to figure out who John was, and what the Hell that two-dot thingie is. Tebow won the Heisman Trophy for his college career, causing an instant commotion in the NFL despite his unmarketable personal beliefs. These could not be kept under wraps, as Tebow had begun to write Bible citations on top of the anti-glare paint below his eyes. In the 2009 BCS Championship Game with its dozens of zoom lenses, Tebow signaled that the play-call could be found at John 3:16. To prevent a recurrence of this disaster, the NCAA helpfully took time out from threatening teams for allowing smoking and for having a mascot based on Indian tribes even if they like it, to lay down the "Tebow Rule." This prevents players from displaying messages on face paint except when an approved sponsor has made a hefty payment directly to the conference. The Denver Broncos drafted Tebow 25th overall. Head Coach Josh McDaniels would spend the next two months denying he wanted a wholesome Christian because he was prejudiced against black Muslims from the inner city with criminal histories. But Tebow set more records, this time for total sales of uniform jerseys. He started the final three games of that year, and got the job for good, six games into 2011. He led the team on a wing and a prayer, often throwing a Hail Mary pass. However, the off-field stuff wouldn't stay off the field, as Tebow magnified the controversy that dogged him, now admitting that he was not just a Christian but a virgin. The Broncos did get a small taste of the post-season in 2011, and John Elway declared that Tebow would be the starting QB again in 2012, though he needed to "pull the trigger." In fact, Elway would be the one pulling the trigger, trading Tebow to the New York Jets. Fantasy experts believe that Tebow broke his vow of chastity some time in 2012 and the vengeful LORD took HIS retribution. Tebow's statistics for 2012 are two broken ribs and only 8 passes. With the new, gay-friendlier NFL rebranding franchises such as the "Packers" and the "Rams," there was no room for an evangelical Christian at quarterback. 2012 had been a transformational year for the NFL. Its polling and focus groups said fans wanted a kinder, gentler brand of football, one more in touch with our gay inner selves. Spokesman Alan Alda declared on behalf of the league that homosexuals were welcome at any football game, and players who said, while the cameras were rolling, "Just keep the faggots out of the locker room" were walked out the next day to read an apology written by someone a bit more comfortable wearing a necktie. The league made continued baby steps to protect its players, with new penalties against spearing, chop blocks, and hurtful words. The continued presence of an openly Christian player, however, blurred the entire message. As much as Tebow might clarify that he "loved the sinner but hated the sin," a plan was hatched and he was sent to the New England Patriots. Tebow had excelled in Denver based on the prayers of fans, but the only thing that fans in Boston pray for is for someone richer than themselves to break his neck. Just not Tom Brady. That is, Boston already had a marquee quarterback, and a backup quarterback, and no one was buying the varying theories for the Pats' signing of a third quarterback, such as "take the best athlete" and "develop him over several years." Tebow played in exhibition games, but only set records for hurried passes into quadruple coverage. He did keep anyone from debating whether the real backup quarterback could take over if Brady went down (though no one yet remembers his name). Sadly, the Patriots released Tebow, but they did promise to exchange any Tebow jerseys that Patriots fans had bought for more poorly selling ones, such as the Aaron Hernandez model. This page was last edited on 19 December 2013, at 02:49.